Inspired by Mahatma Gandhi’s idea of sustainability, Divyanshu Asopa invented ‘Beej-Kapas’, a special paper which can get converted into soil. ‘Few years back, while shifting our office, I realised that over a period of time I have wasted a lot of paper. As an entrepreneur, I wanted to be a part of solutions to the problems in our country and not create more difficulties. And, that’s when I realised, I need to do something in order to stop paper wastage in India,’ says 30-year-old Divyanshu Asopa. Today, he is known for inventing a special paper that when sowed in the soil grows into a plant – ‘Beej-Kapas’. So the first step was to use this paper to create products using this innovation. From making greeting cards, wedding cards, corporate cards, coasters, tags, paper bags to calendars, Divyanshu is creating many beautiful items using his special paper. So that when it came to discarding, these products after use these will not end up in the garbage pile like the traditional paper products. This idea of sustainability and waste management was not a eureka moment for me, but, a gradual process. Over the years, I have seen myself and others wasting so much paper. When we buy greeting cards or a wedding cards for instance, we use it for a certain time period and after that it just goes into waste. That’s what I wanted to change, I wanted to come out with a paper that can get a new lease of life. That’s why we invented Beej-Kapas, which is a special handmade paper and is made from seeds and cotton. After the product has been used, one can put the paper in the soil, the cotton used to make that paper will start decomposing itself in the soil and the seeds will start to germinate and slowly become a plant. Our recent innovation is Kyaari – a calendar framed inside a wooden frame which is made from already used wood. In a year this calendar will help you create a beautiful garden full of marigold, basil, tomato and coreopsis plant. 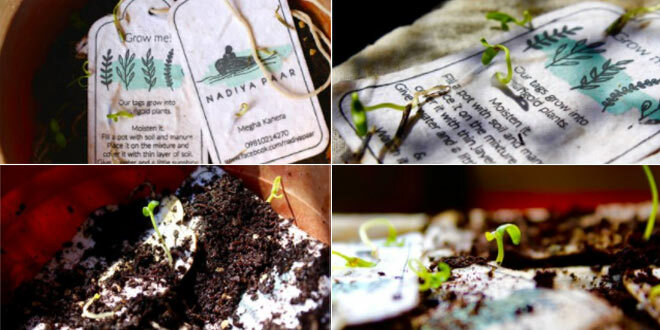 All you have to do is put each passing month’s paper in the soil and soon you will have your very own garden. Kyaari can be purchased for ₹1,199. 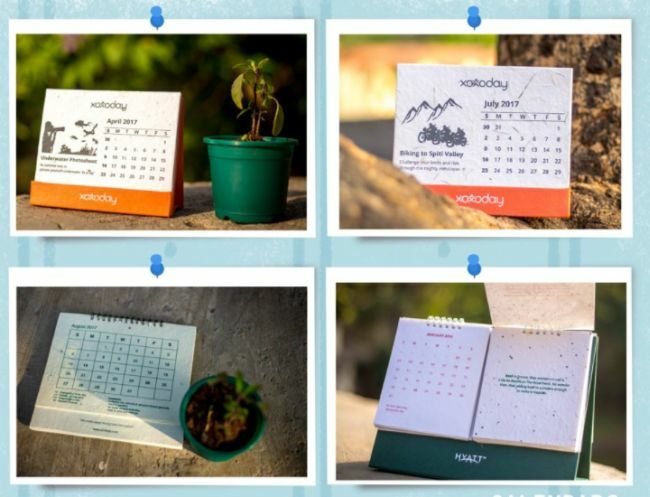 Calendar that can create a garden for you! Sustainability and waste management starts from people who are responsible for creating waste. We all need to put in a thought how a particular product will end up affecting the environment we are living and then come out with solutions. It is no rocket science to manage waste, all you need is little effort. In India, 25% of landfill waste comes from paper and our country consumes 10 kg of paper per person per year and thousands of trees are cut every year in order to produce it. If more and more people start using Divyanshu’s products then this paper waste burden can be eased from the overloaded landfills. Previous Post: Move Over Big fat Indian wedding! Check Out This Eco-Friendly Wedding In Kerala And It Is Nothing Less Than An Inspiration. Next Post: Meet This 27 Year-Old Man Who’s Behind The Amalgamation Of Women Empowerment And Environment.